According to the TSA.gov website, the required compliance date for some TWIC users has been pushed back to December 1st (from Octber 31st) due to a power surge event at the MD facility housing the central computers that drive the system. The TWIC program is a huge step forward for port security. The cards will most assuredly provide the level of identity verification that our security services have needed for quite some time. We say: Although the TWIC does have inherently fraud-proof features, why not increase the security of the internal ICC chip by protecting it with the SkimSAFE Electromagnetically Opaque Sleeve? The SkimSAFE costs less than $5 (far less than the $100+ price for each TWIC) and it provides a priceless level of security to the cardholder and a boost to the integrity of the system as a whole. 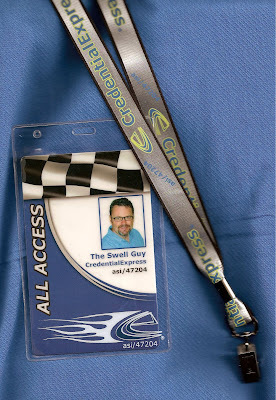 SkimSAFE protects TWIC, CAC, PIV, and many other cards including RFID cards used in the private sector for facility access control and logical access to PC workstations. It's the smart choice for users of contactless cards. The electromagnetically opaque sleeve is available here in packs of 25. Why doesn't media get photo ID right? Last month GM was running their "Employee Pricing" sales program to boost sales. I noticed the poster at the local Chevy dealership showed a bunch of employee photo ID cards, but the corners were square, not rounded. How did the advertising folks not catch this? Below is the opening sequence for the TV show "Chuck". Pretty clever. Not a bad badge, but I would expect a last name somewhere. And I'm sure not protecting the barcode from making a copy would never be a problem. The high quality of employees at office stores would never swipe in a time clock for each other! 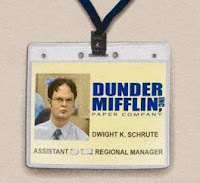 There there is the ID badge above meant to replicate "The Office" photo ID. What's up with this? Is it still 1984? When was the last time any company used an ID that was not PVC? The size is even non-standard. And the setting is a remote office, so wouldn't it be sweet if they had to "swipe the old time clock" every day? Sigh...maybe I've just become a photo ID geek. Terrorist organisations operating in Kashmir could be asking their cadres to carry forged voter’s identity cards purportedly issued by governments of southern States, including that of far-flung Kerala, to possibly demonstrate that they have a pan-India support for their cause, official sources said. We say: Customers often ask the cost of ID card security features and then elect to cut costs by not utilizing the available technologies. Do you think a few extra dimes or nickels is a good investment when it can save lives? And it is not just a problem for other outposts in other parts of the world!